Keywords: burns; wound healing; procedural pain; pain assessment; analgesia. Inadequate pain management is detrimental to burn patients. The difference between continuous background pain and pain due to therapeutic procedures, such as dressing changes, must be evaulated and treated separately. Control of procedural pain is impossible without strong pharmacological treatments, such as intravenous opioids. Non-pharmacological therapies should never be used alone. The management of burn pain at dressing changes is generally overlooked. The future of burn care must focus on the optimal control of pain to avoid patient suffering and reduce the risk of post-traumatic stress disorders. This article was recently reprinted in the EWMA journal 2002, vol 2, no 2, 5-9 with permission from World Wide Wounds. This paper focuses on pain associated with dressing changes in burn patients. The pain experienced during such procedures is often excruciating, although this issue is frequently overlooked. The author emphasises the need for accurate pain assessment in both children and adults, and describes a variety of pharmacological and non-pharmacological methods of pain management. In a recent international wound care survey on pain and trauma at wound dressing changes, dressing removal was considered by practitioners to be the time of greatest perceived pain . Burn injuries cause intense and prolonged pain, made worse by the need to change dressings frequently to prevent infection and aid healing. Modern techniques such as early excision and skin replacement therapy have reduced the number of dressing changes necessary to treat a burn injury . Nevertheless, daily cleansing of the wound, topical applications and occlusive dressings remain the preferred recommended management technique, especially for injuries where sufficient epidermal living cells remain to ensure a degree of satisfactory spontaneous healing. Because a burn injury can be heterogeneous, it may be necessary to wait eight to ten days before determining which tissues need to be excised and grafted, and which will heal by themselves. Choiniere et al  examined the characteristics of pain experienced by burn patients and identified that the time of greatest pain is usually experienced during therapeutic procedures. The study emphasised the need to distinguish between this type of procedural pain and background pain (at rest) that, once assessed and evaluated, can be managed pharmacologically with paracetamol, non-steroidal anti-inflammatory drugs (NSAIDs) and opioids. The aim of zero background pain in burn injuries is an achievable and perfectly realistic goal. However, procedural burn pain as a result of dressing changes is difficult to assess and manage , and there is no consensus among burn specialists on how best to determine or control this pain. Studies have shown that procedural pain is widely under treated, even in specialised burn centres , . In addition, pain control, even when recognised as important, can be further constrained by a lack of staff training, time and monitoring capabilities. Undertreated pain in burn patients can result in non-compliance with hospital treatment, disrupted care  and increased risk of post-traumatic stress disorders , . The immediate pain that follows a burn injury is due to the stimulation of skin nociceptors (pain sensing nerves). Nerve endings that are completely destroyed will not transmit pain, but those that remain intact will trigger pain throughout the time and course of treatment, as will regenerating nerves - those still connected with intact afferent fibres . A burn injury will immediately prompt an intense inflammatory response and the release of chemical mediators that sensitise the active nociceptors at the site of injury. This will cause the wound to become sensitive to mechanical stimuli such as touch, rubbing or debridement, as well as chemical stimuli such as antiseptics or other topical applications. Continuous or repeated peripheral stimulation of nociceptive afferent fibres induces a significant increase in dorsal horn excitability, partly via N-methyl-D-aspartate (NMDA) receptors , leading to increased sensitivity in the surrounding unburned areas of skin. This so called 'wind-up' pain, as shown in recent studies by Pedersen and Kehlet  is a component of post-burn hyperalgesia, and is exacerbated by the mechanical stimulation that occurs as a result of frequent dressing changes. This 'wind-up' mechanism may also be partly responsible for a patient's increased pain sensitivity observed during the course of burn management and reflected in the greater opioid requirement for dressing changes over time . Ketamine, a potent NMDA antagonist, works by blocking the pain transmission pathway implicated in the development of central sensitisation. It has been used extensively in burn patients for more than 40 years , although this property was not recognised for some years. Patients with severe burns who require dressings over a long period of time may continue to experience pain despite an escalation in opioid dose requirement. This phenomenon cannot be explained by the pharmacological effects of burn injuries such as hypermetabolism . Whether this is due to opioid tolerance or increased pain sensitivity, it is important to be aware that the pain does not usually decrease over the time and course of treatment. It is essential to recognise the significance of the clinical technique used in the first dressing, which is usually applied on admission. Inadequate pain management at this stage will have lasting effects. The patient may, for example, dread subsequent dressing changes and lose confidence in the care team. Atchison et al  have analysed pain at different stages of the wound dressing procedure and identified the most painful stage to be the removal of the innermost layer of gauze, which usually adheres to some degree to the wound bed. This was followed by debridement and topical applications. It is important to note that post-dressing background pain intensity is always greater than the pain experienced before a dressing change. It has also been suggested that pain increases with the size of the burn . The time it takes to change the dressing will depend on the extent of tissue damage, but dressings applied to the face and hands will take longer than those applied to other parts of the body. In an unpublished study for the French national insurance system, burn specialists estimated that it took three people a total of 138 minutes (46 minutes per person) to dress a 10-30% burn (not involving the face or hands); 105 minutes for three people to dress a facial burn (35 minutes each); and 66 minutes for three people to change a hand dressing (22 minutes each) (this did not include the person responsible for analgesia). The excision of non-viable tissue and the application of skin grafts decreases the duration of a patient's pain. Not only will these procedures reduce the number of painful dressings changes required, but the wound itself will also feel less painful, despite having undergone a surgical procedure. The donor sites are likely to be painful for 48 to 72 hours. The first dressing following a skin graft is particularly significant, as the pain will be caused predominantly by the removal of staples; an alternative is to use resorbable stitches to reduce trauma and pain. Donor-site dressings should be left in place until they peel away of their own accord. In a patient with newly healed burns, the pain and discomfort experienced during dressing changes will originate in the small unhealed areas or are related to other procedures such as concomitant physiotherapy. It is important that clinicians assess pain intensity to establish the severity of pain and the effectiveness of analgesia. The pain experienced by burn patients varies greatly from patient to patient . For this reason treatment protocols stipulate low starting doses of analgesia, and allow for adjustments to be made based on the individual pain assessment. For adults and children aged over seven, a visual analogue scale or a verbal numeric scale are excellent tools for assessing pain . The picture-based Children Hospital of Eastern Ontario Pain Scale (CHEOPS) is well suited to assessing burn procedural pain in young children. Some dressing changes are undertaken in a Hubbard tank or in theatre. However, because of the risk of cross-infection, most dressings changes are carried out in the ward. Box 1 lists the requirements needed for optimal opioid analgesic therapy at burn dressing changes. Avoid prolonged fasting whenever possible as adequate nutrition and hydration are essential for the healing process. Intravenous medications, especially IV opioids, are well suited to fulfill the requirements in Box 1. This is because IV morphine can be given in small incremental doses , however, its delayed onset of action (10 minutes) and longlasting effects (several hours) do not allow for the analgesic therapy to be adjusted easily to meet individual needs. Therefore, short-acting medications such as fentanyl, alfentanil and remifentanil are more appropriate for pain relief in burn patients. When administered intravenously, alfentanil, a mu agonist, is a fast-acting medication, reaching peak effect in one minute. There is rapid pain relief and its relatively short duration of action (mean half-life 90 minutes) fits well with the mean time taken to change a dressing, providing good post-procedural analgesia. Clinical experience suggests a starting dose of 10mcg/kg, which is repeated every minute according to the level of pain; the mean starting dose for changing burn dressings has been found to be 22�12mcg/kg, with a mean total dose of 29.9�18mcg/kg for procedures that take 41�20min . Combining repeated boluses with a continuous infusion of 2mcg/kg/min is effective in improving pain relief (Figure 1). Remifentanil is even shorter acting; its quick and complete catabolism by plasmatic esterases makes it extremely useful in the case of high-risk patients, but because the drug is short-acting it has the disadvantage of not being capable of providing lasting post-procedural pain relief. Partial mu agonists or antagonists such as nalbuphine or buprenorphine are of little interest because of their limited maximal efficacy ('ceiling effect'). The use of IV opioids for severe procedural pain does, however, have its drawbacks in that some patients may require such high doses of analgesia, that there is an increased risk of apnoea and loss of consciousness. This can be problematic during the first dressings of superficial burns, as patients may need to undergo extensive debridement of necrotic tissue. In these cases, to avoid subjecting the patient to pain, the option of general anaesthesia should be considered. Midazolam and various anxiolytics should be used with great caution and only under expert supervision as they act synergistically with opioids to potentially increase the risk of respiratory depression and reduced mental awareness. They should, therefore, be used to treat anxiety only, which is usually anticipatory and can be reduced considerably with efficient analgesia  and thoughtful pre-procedure preparation of the patient. The option of involving a skilled anaesthetist in order to use anaesthetic agents such as ketamine or propofol should be considered for achieving 'conscious sedation' versus general anaesthesia. Sub-anaesthetic doses of ketamine have been used extensively for many years, especially in children in whom its unpleasant dysphoric side effects are less pronounced ,. Low-dose propofol has also been suggested for short procedures , but its safety at the bedside remains questionable. the usually long post-procedural sedation. For patients who have become intolerant to morphine through prolonged treatments, oral methadone  can be used as an alternative. Oral ketamine has also been used, although its effects can be unpredictable. The recommended dosage is 10- 20mg/kg . Fentanyl lollypops are a more interesting alternative; they have a rapid onset of action (within a few minutes) and a longer-lasting effect than IV fentanyl due to their double mechanism of absorption (transmucosal and gastric). Nitrous oxide (Entonox) is one of the most popular and safest anaesthetic agents used with burn patients . It has a rapid onset of analgesia and can be used for the duration of the procedure. However, it has a very limited analgesic potency and although it is widely prescribed there is no up-to-date published research on its use in burns . Recent research , on the effects of distraction therapies in reducing burn procedural pain shows that anticipation of pain increases pain intensity and discomfort, which can be decreased by diverting the patient`s attention. Distraction through use of interactive computerised virtual reality , for example, can have a significant analgesic effect. The same is true for hypnosis, which is used extensively by a number of burn teams . These supportive techniques may be time-consuming, but they can help to reduce the feelings of fear and anxiety, especially during long procedures. However, they must always be used in conjunction with pharmacological treatments, and should never replace them . Children aged between birth and four years old represent approximately 20% of all hospitalised burn patients . Several studies show that procedural burn pain in children is largely underestimated and under treated ,. However, these shortcomings can be overcome by adhering to protocols similar to those used for adults, since the pharmacokinetic and pharmacodynamic differences between children and adults are minimal. For infants less than three months old, the adult opioid dosages must be divided by three because of hepatic and renal immaturity . In children older than three months, the pharmacokinetic effects are similar to those in an adult. In preschool-age children, the half-lives of morphine and alfentanyl are 50% those in adults, which explains the need for higher dosages . Despite some clinicians` preconceptions, the pharmacodynamics of opioids, especially the effects of respiratory depression, are no different in infants than in adults . Accidental over dosage mostly occurs because of the difficulties of pain evaluation (overestimation) in children rather than the actual pharmacodynamic specificity of a drug. In addition, special attention should be paid to the child`s environmental conditions. For instance, a parent`s presence and participation in the procedure can have a highly beneficial effect . About 95% of burn patients are treated on an outpatient basis, but only 75% of these patients receive medication at dressing changes . There is scant literature on the subject and, unfortunately, there are no published guidelines for best practice. In the author`s opinion, most protocols involving short-acting IV opioids used at the bedside are suitable for use in the outpatient setting provided there are facilities for post-procedural surveillance. The question as to whether pain has a detrimental effect on the healing outcome for burn patients remains largely unanswered and requires further investigation. The avoidance of patient suffering is, however, a key objective as under-treated pain in burn patients can result in noncompliance with hospital treatment. This can disrupt care and increase the risk of post-traumatic stress disorders. In burn management the issue of pain at dressings changes is generally overlooked. The future of burn care lies in ensuring optimal control of pain from the outset of care and application of the first dressing, through to the end of treatment. The process is technically feasible if clinicians, in the first instance, acknowledge that pain plays a crucial role in burn management. They must also accept the need to equip themselves with appropriate knowledge, and recognise the need to devote more time and funding towards the improvement of pain management for burn patients. To view the EMWA Position document: 'Pain at wound dressing changes', please visit www.tendra.com/painposition. The document is available in English, French, German, Italian and Spanish. 1. Moffatt CJ, Franks PJ, Hollinworth H. Understanding wound pain and trauma: an international perspective. EWMA Position Document: Pain at wound dressing changes. 2002; 2-7. 2. Sheridan RL, Tompkins RG. Skin substitutes in burns. Burns 1999; 25(2): 97-103. 3. Choiniere M, Melzack R, Rondeau J, Girard N, Paquin MJ. The pain of burns: characteristics and correlates. J Trauma 1989; 29(11): 1531-9. 4. Foertsch CE, O'Hara MW, Stoddard FJ, Kealey GP. Treatment-resistant pain and distress during pediatric burn-dressing changes. J Burn Care Rehabil 1998; 19(3): 219-24. 5. Sheridan RL, Hinson M, Nackel A, Blaquiere M, Daley W, Querzoli B, Spezzafaro J, Lybarger P, Martyn J, Szyfelbein S, Tompkins R. Development of a pediatric burn pain and anxiety management program. J Burn Care Rehabil 1997; 18(5): 455-9; discussion 453-4. 6. Ulmer JF. Burn pain management: a guideline-based approach. J Burn Care Rehabil 1998; 19(2): 151-9. 7. Andreasen NJ, Noyes R, Hartford CE, Brodland G, Proctor S. Management of emotional reactions in seriously burned adults. N Engl J Med 1972; 286(2): 65-9. 8. Schneiber S, Galai-Gat T. Uncontrolled pain following physical injury as the core trauma in post-traumatic stress disorder. Pain 1993; 54: 107-110. 9. Taal LA, Faber AW. Burn injuries, pain and distress: exploring the role of stress symptomatology. Burns 1997; 23(4): 288-90. 10. Devor M. The pathophysiology of damaged peripheral nerves In: Wall PD, Melzack R, editors. Textbook of Pain (3rd edition). Edinburgh: Churchill Livingstone, 1994. 11. Pedersen JL, Kehlet H. Hyperalgesia in a human model of acute inflammatory pain: a methodological study. Pain 1998; 74(2-3): 139-51. 12. Dickenson AH, Sullivan AF. Evidence of a role of the NMDA receptor in the frequency-dependant potentiation of deep rat dorsal horn nociceptive neurons following C-fiber stimulation. Neuropharmacology 1987; 26: 1235-38. 13. Pedersen JL, Kehlet H. Secondary hyperalgesia to heat stimuli after burn injury in man. Pain 1998; 76(3): 377-84. 14. Choiniere M. The pain of burns In: Wall PD, Melzack R, editors. Textbook of Pain (3rd edition). Edinburgh: Churchill Livingstone, 1994. 15. Latarjet J, Lepine O, Dorne R, Sayag JL, Vidalain B, Banssillon VG. [Use of ketamine in the burned patient (apropos of 1,000 anesthesias)]. Anesth Analg (Paris) 1975; 32(5): 763-81. 16. Choiniere M. Burn pain: a unique challenge. Pain Clinical Updates 2001; 9: 1-4. 17. Atchison NE, Osgood PF, Carr DB, Szyfelbein SK. Pain during burn dressing change in children: relationship to burn area, depth and analgesic regimens. Pain 1991; 47(1): 41-5. 18. Choiniere M, Auger FA, Latarjet J. Visual analogue thermometer: a valid and useful instrument for measuring pain in burned patients. Burns 1994; 20(3): 229-35. 19. McGrath PG. Pain in Children. New York: Guildford Press, 1990. 20. Meyer WJ, Marvin JA, Patterson DR, et al. Management of pain and other discomforts in burned patients In: Herndon D, editor. Total Burn Care. Philadelphia: WB Saunders, 1996. 21. Latarjet J, Choinere M. Pain in burn patients. Burns 1995; 21(5): 344-8. 22. Ebach DR, Foglia RP, Jones MB, Langer JC, Skinner MA, Moushey R, Meadows L. Experience with procedural sedation in a pediatric burn center. J Pediatr Surg 1999; 34(6): 955-8. 23. Slogoff S, Allen GW, Wessels JV, et al. Clinical experience with sub-anesthetic ketamine. Anesth Analg Curr Res 1974; 53(3): 354-8. 24. Nahata MC. Plasma concentrations of morphine in children with chronic pain - comparison of controlled release and regular morphine sulphate tablets. J Clin Pharm Ther 1991; 16(3): 193-5. 25. Williams PI, Sarginson RE, Ratcliffe JM. Use of methadone in the morphine-tolerant burned paediatric patient. Br J Anaesth 1998; 80(1): 92-5. 26. 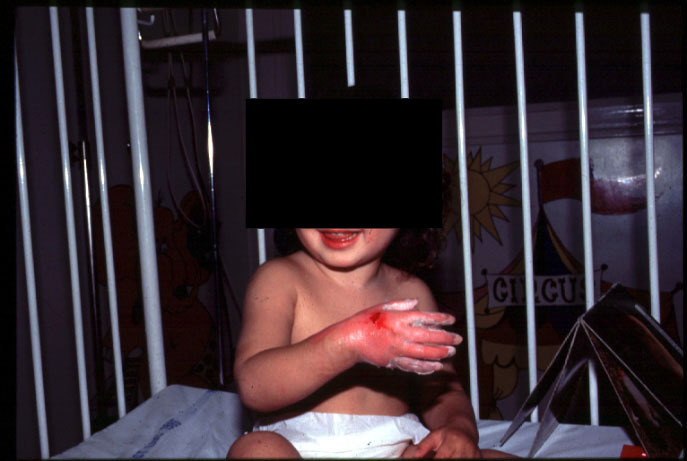 Humphries Y, Melson M, Gore D. Superiority of oral ketamine as an analgesic and sedative for wound care procedures in the pediatric patient with burns. J Burn Care Rehabil 1997; 18(1 Pt 1): 34-6. 27. Sharar SR, Bratton SL, Carrougher GJ, Edwards WT, Summer G, Levy FH, Cortiella J. A comparison of oral transmucosal fentanyl citrate and oral hydromorphone for inpatient pediatric burn wound care analgesia. J Burn Care Rehabil 1998; 19(6): 516-21. 28. Baskett PJ. Analgesia for the dressing of burns in children: a method using neuroleptanalgesia and Entonox. Postgrad Med J 1972; 48(557): 138-42. 29. Pal SK, Cortiella J, Herndon D. Adjunctive methods of pain control in burns. Burns 1997; 23(5): 404-12. 30. Peyron R, Garcia-a-Larrea L, Gregoire MC, Costes N, Convers P, Lavenne F, Mauguiere F, Michel D, Laurent B. Haemodynamic brain responses to acute pain in humans: sensory and attentional networks. Brain 1999; 122: 1765-80. 31. Rainville P, Hofbauer RK, Paus T, Duncan GH, Bushnell MC, Price DD. Cerebral mechanisms of hypnotic induction and suggestion. J Cogn Neurosci 1999; 11(1): 110-25. 32. Hoffman HG, Patterson DR, Carrougher GJ. Use of virtual reality for adjunctive treatment of adult burn pain during physical therapy: a controlled study. Clin J Pain 2000; 16(3): 244-50. 33. Patterson DR, Adcock RJ, Bombardier CH. Factors predicting hypnotic analgesia in clinical burn pain. Int J Clin Exp Hypn 1997; 45(4): 377-95. 34. van Rijn OJ, Bouter LM, Meertens RM. The aetiology of burns in developed countries: review of the literature. Burns 1989; 15(4): 217-21. 35. Kart T, Christrup LL, Rasmussen M. Recommended use of morphine in neonates, infants and children based on a literature review: Part 1 - Pharmacokinetics. Paediatr Anaesth 1997; 7(1): 5-11. 36. Olkkola KT, Hamunen K, Maunuksela EL. Clinical pharmacokinetics and pharmacodynamics of opioid analgesics in infants and children. Clin Pharmacokinet 1995; 28(5): 385-404. 37. Lynn AM, Nespeca MK, Opheim KE, Slattery JT. Respiratory effects of intravenous morphine infusions in neonates, infants, and children after cardiac surgery. Anesth Analg 1993; 77(4): 695-701. 38. Doctor ME. Parent participation during painful wound care procedures. J Burn Care Rehabil 1994; 15(3): 288-92; discussion 287. 39. Choiniere M. Prescribing Practices for Analgesia in Adults and Children with Minor Burns. 10th Congress of the International Society for Burn Injuries. 1998.